Neung Roi is easily the finest Thai restaurant in Delhi. I know many people who have favourites in the regular menu (as do I) since the bold and wholesome flavours are ever so consistent under the leadership of Chef Yenjai Suthiwaja. That is why when Ruchira Hoon Phillip invites a small group for a preview of the Mango Festival, she ensures that the menu offers a good mix of special dishes from the festival along with the regulars. Before I start describing my meal in detail, I have to tell you that my mouth is watering while seeing my pictures and thinking of the dishes! Top: Pomfret with Red Curry and Sweet Mango. Grilled Chicken and Raw Mango Salad. We start with the salads. Yam Som-O, pomelo salad with crispy onion, garlic and palm sugar tamarind dressing is as good as always, and as much as I like it I am happy to report that I actually prefer the raw mango salad on this occasion. It is nice to genuinely like a dish that is offered in a food festival - it just goes to show that the festival has been thought through and adds value to the experience of the diners. Yam Mamuang Pla Thod features raw mango salad with crispy fish, while Yam Gai Yang mamuang offers succulent strips of fried chicken with raw mango salad. This is followed with Porpia Ped, or deep fried duck spring roll with green mango. The spring rolls can be crisper, though the filling is nice. 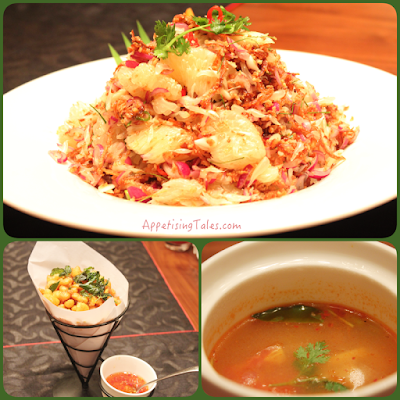 Despite all the non-vegetarian dishes on the table, the Tohu Song Khurg is quite a star. Tofu and betel nut leaf is served in a pandanus cup with a tamarind palm sugar sauce and roasted coconut. The fried tofu is silken and soft to bite and the tangy-hot-sweet sauce is perfectly balanced. Bottom L-R: Corn Fritters; Tom Yum Gai. While Tod Man Khao Pod or corn fritters served with sweet chilli sauce offer a good crunch and the Tom Yum Gai is flavourful and a tad sweeter than normal, I have my eyes on the gorgeous fish that lays before me. Pla Jaramed Rad Khurg Geang is deep-fried whole pomfret with red curry and sweet mango. The combination of the crispy skin and sweet mango in the red curry sauce is a treat to the palate. The rest of the meal features my favourites from the regular menu. 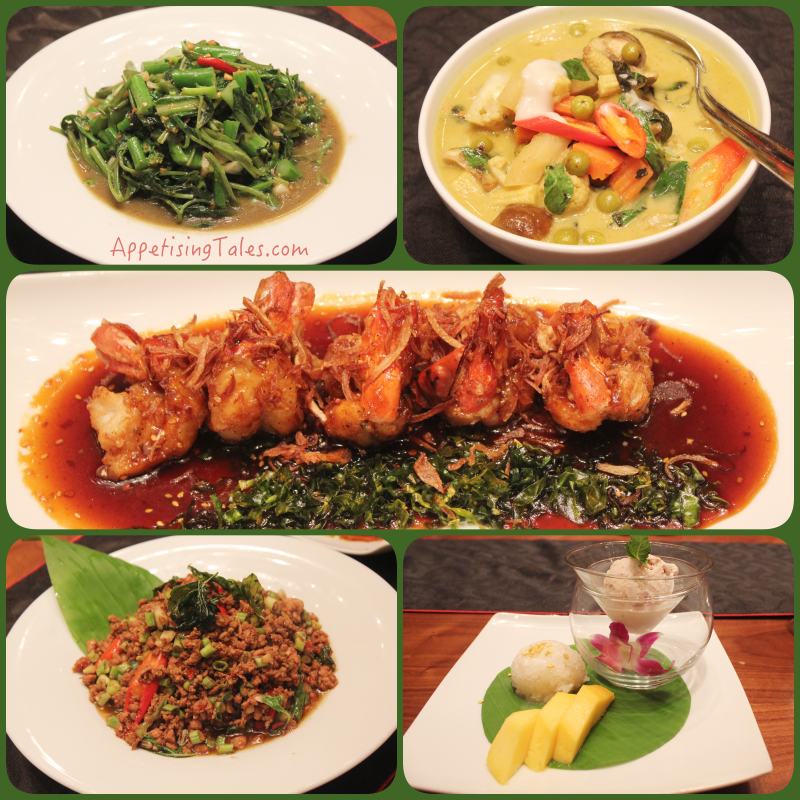 Goong Thod Ha Rod, fried prawn in a home made five flavour sauce and fresh coriander and Phad Pak Kiew, stir fried kale with morning glory, pokchoy, soya bean sauce, garlic and pepper. The lovely colours of the latter is a feast for the eyes and takes care of my quota of greens in the most delicious way. Then there is Chef Yenjai’s signature Gaeng Kiew Wan Pak or mixed vegetables in Thai green curry that has all the flavour without the extra creaminess that one finds in most Thai curries served in Delhi. Top L-R: Stir fried Greens; Vegetable Green Curry. Middle: Fried Prawn in Five Flavour Sauce. Bottom L-R: Minced Chicken; Banana Ice cream, Sticky Rice and Mango. 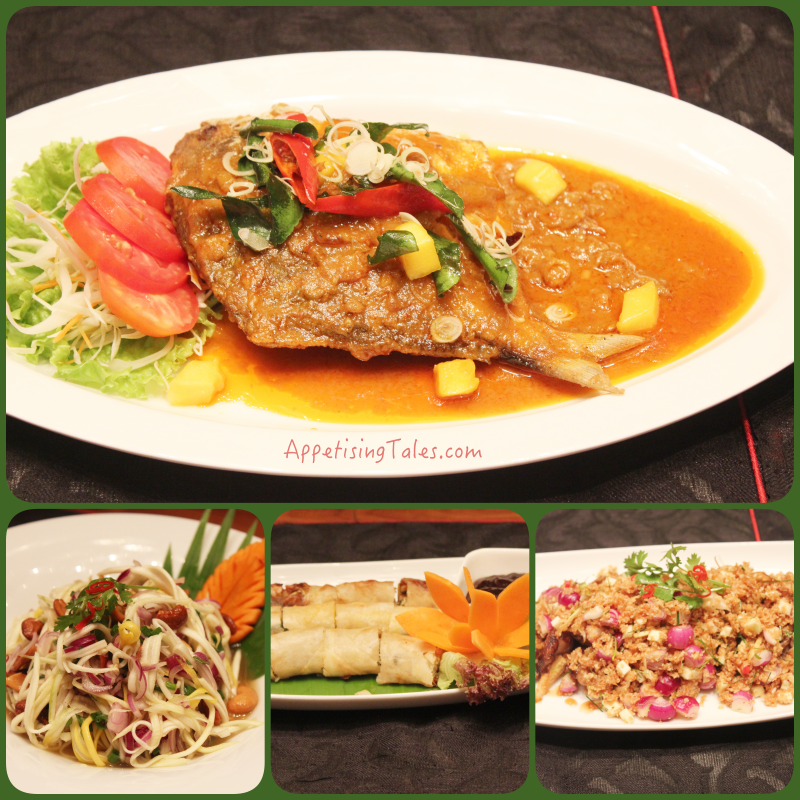 The Mango Menu also features Fish & Raw Mango Soup with Thai herbs and Sour Fish Curry with Green Mango. Going by the dishes that we taste from the special menu, I can safely recommend you to try these, as well as the Coconut Brulee with Fresh Mango. We, however, stick to the sticky Khao Niew Mamuang, sticky rice with fresh mango and banana icecream. The icecream has frozen bits of banana, and I really like the crunchy moong dal atop the sticky rice. The sweet fresh mango on the side is a delight as always. The icing on this delicious meal is the friendly banter on the table. Nothing better to connect with like-minded people than over a fab meal. Neung Roi, Radisson Blu Plaza Delhi, National Highway-8, Mahipalpur, Near I.G.I. Airport, New Delhi-110037. Dates: Mango Festival 10th-19th June'16. Timings: 12 noon to 3pm; 7pm to 11.45pm.